Staten Island – the forgotten borough. It’s typically known for the mall, the garbage dump, the free ferry and traffic. What you didn’t know is that you can find great restaurants there. WHAT? Yes you read right, great restaurants. 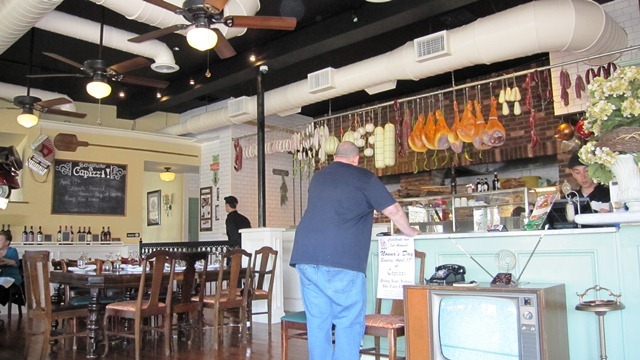 And a few weeks ago I grabbed my bestie, a Staten Island resident, and headed out to sample a newcomer in town…..Capizzi. 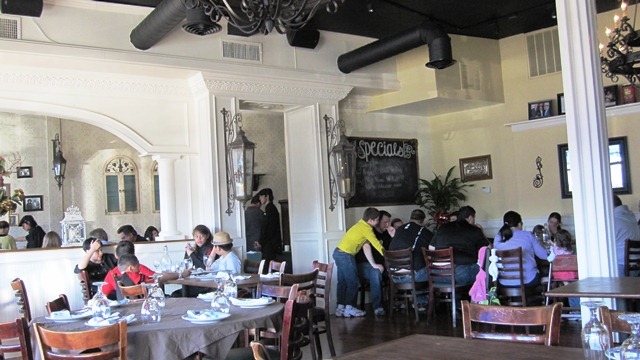 Capizzi is located in the Great Kills section of Staten Island at 4126 Hylan Boulevard, home to the former La Bella Restaurant. They also have a small brick over pizzeria in the Hell’s Kitchen of Manhattan. We were invited for Nonna Day which is Grandmother Day. If you brought your Nonna to the restaurant, she ate for FREE. Armed with my bestie and not my Nonna, we headed over anyway. The drive from Manhattan on a Sunday, wasn’t bad at all. It took about an hour, which is what I expected. I dreaded the thought of having to find parking but as I pulled up to the restaurant, the valet greeted me and tucked my car into a safe spot. Phew! It was a beautiful sunny day, so the outdoor seating area was a buzz with diners sipping cocktails and catching some rays. I sat in the front bar area scoping out the land while awaiting from friend to arrive. Behind the hostess were hanging salami, prosciutto, cheese and other cured meats over the heads of the cooks preparing fresh made pizza. The smells coming from the kitchen were making my mouth water and hoped my friend would arrive shortly. Luckily she did. Stefania, the restaurant manager, greeted us and sat us in the main dining area. We were sat at a quaint table by the window and handed our menus. She looked at us and said; “Scusi, a hint of her charming Italian accent, but there is a private event going on in the next room. If that is a problem, I can move you to another table.” Don’t be silly, we both said. This is fine. The two of us looked around and in unison said, I love the decor. The walls were a cream/eggshell color, dark wood floors and tables. Very rustic and charming. My friend leaned and asked, “have you gone to the bathroom yet?” I replied yes and knew where this conversation was going. My bestie is a bit of a germaphobe and is very picky where she eats, drinks and well…relieves herself. I assured her the bathroom was clean and pointed to where it was. I giggled to myself and thought – somethings never change. Returning to the table, she gave it a thumbs up. All right we are in business. Our server, wearing his uniform of all black and a cap, took our wine order while we browsed the menu. Pinot Grigio for me and Sangiovese for her. Starving and trying to watch our waistlines, we agreed we wouldn’t go for pasta or pizza, even though it smelled and looked amazing. Our charming server came back, took our orders and the feasting began. 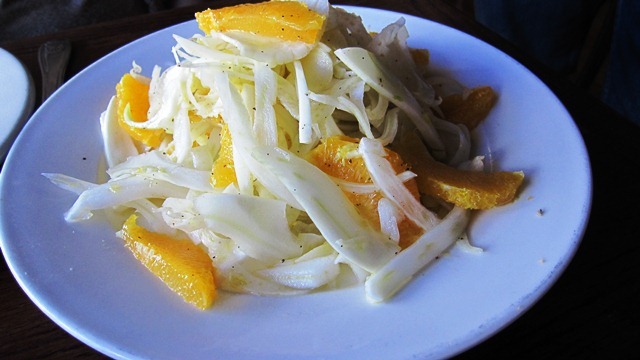 A crisp refreshing fennel salad with oranges was ordered by bestie. Truly one of my favorite salads and one that I make at home all the time. It was lightly dressed with a dressing of citrus and olive oil, my favorite and go to dressing. The portion was HUGE and I dipped my fork in a few times. If you love crunch and licorice flavor, try it. I decided to be bad and ordered the rice balls or as some call it arancini, which means a small orange. I can’t help it, it was calling me. 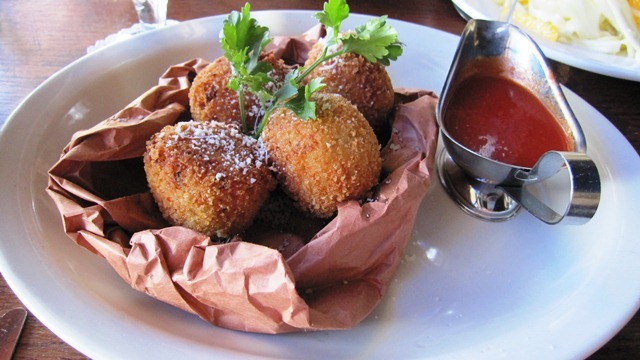 Four rice balls were nestled in a paper dish with a side of marinara sauce for dipping. Just what I wanted. Crispy outside, cheesy on the inside with a salty note from the prosciutto. Yum!!! We each couldn’t finish our appetizers and our server wrapped them up so we could take them home. Grilled Chicken with vegetables and mashed potatoes for her and Fish Papillote for me. 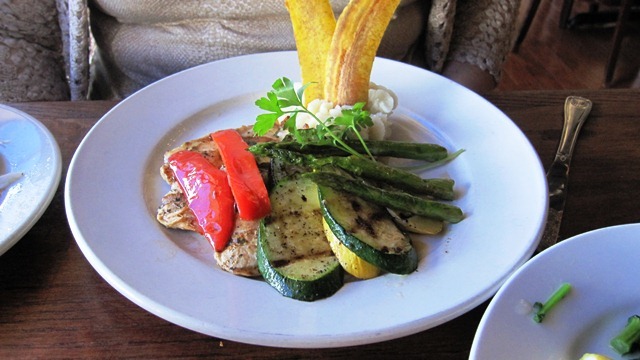 Picture it, thinly pounded chicken breast dressed with a hint of lemon and butter with a side a grilled asparagus, zucchini, red bell pepper and creamy mashed potatoes. She was a happy camper. 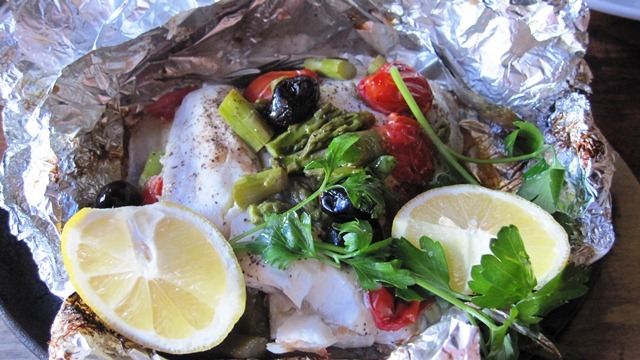 My fish was Branzino, which is a light white fish, that was baked in an aluminum foil pouch with olives, capers, tomatoes, white wine and lemon and then opened to reveal this exquisite parcel. Adorned with two lemon wedges, it was a work of art. 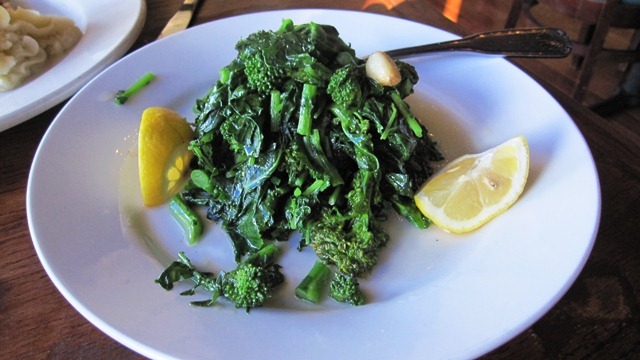 We both love veggies, so we shared a side of broccoli rabe which is bitter broccoli. It was simply prepared with garlic and oil and served with two lemon wedges on the side. Our server kept walking over to see if everything was OK. The two of nodded while chewing and smiling. The meal was outstanding. Fresh ingredients, not over sauced and just delicious. Clean eating at it’s best. The portions were generous, so bestie took the rest of her meal home to have for lunch the next day. I didn’t, well because fish doesn’t reheat well. Stefania then visited us to see if we were satisfied with our meal and to tempt us with dessert. Oh the evil temptation…dessert. We decided to order something we felt would be light and could split. 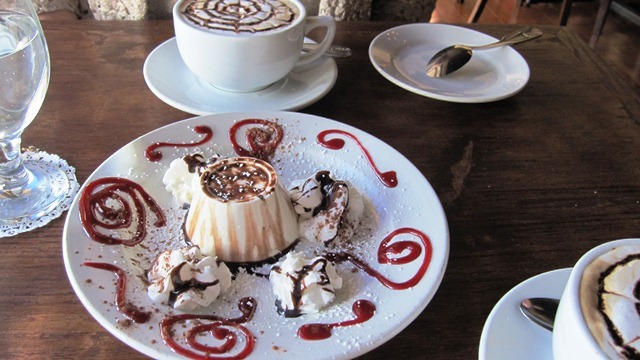 Panna Cotta and a cappuccino for due and an amaretto just for bestie. 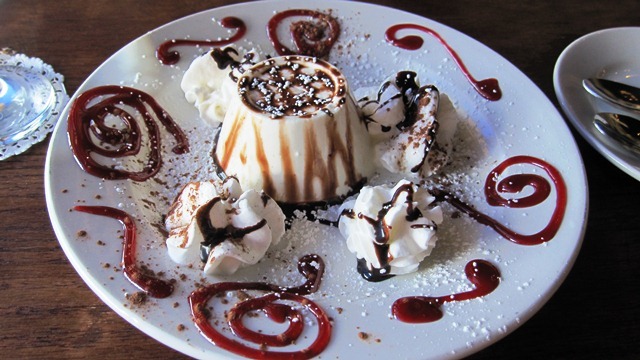 Panna Cotta is like an Italian flan. It’s a light and fluffy custard that if made properly, isn’t overly sweet nor heavy. And this was just that. Drizzled with lines of chocolate, raspberry coulis swirls and a few clouds of whipped cream. Oh my God!!! Outstanding. The perfect sweet to end our meal. Now I’m not a coffee drinker but am a coffee snob. If I’m going to go outside of my comfort zone and drink a coffee, it better be good. 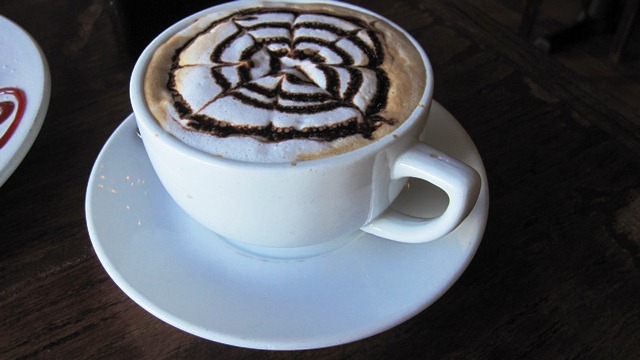 This cappuccino was perfection. Strong espresso topped with steamed frothy milk (skim for both of us) and a spiderweb design of chocolate on top. This could turn this tea drinker to a coffeeholic easily. Thank you Joe Calgano, Stefania and the staff at Capizzi for a memorable meal. Beside enjoying it with my bestie, our server turned out to be the son of someone I grew up with. A la familia. This entry was posted by Rosemarie on Monday, May 9th, 2016 at 9:37 pm	and is filed under Italian, Staten Island. You can follow any responses to this entry through the RSS 2.0 feed. You can leave a response, or trackback from your own site.